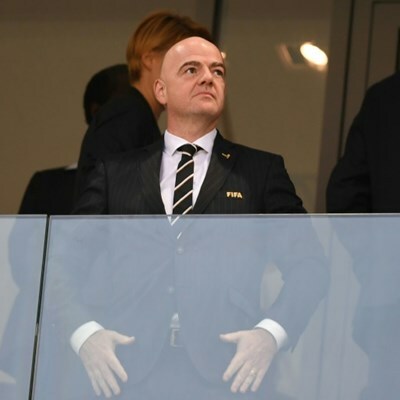 Gianni Infantino said he had been anxiously following the rescue operation. The Thai footballers, aged 11-16, have been stuck in darkness deep underground after setting off to explore the cave with their 25-year-old coach after training on June 23. Fifa president Gianni Infantino has invited the Thai boys’ football team trapped in a cave to the World Cup final as messages of support poured in from top players. Infantino said he hoped the Wild Boars team, who were stranded by rising floodwaters two weeks ago, would be rescued in time to watch the final in Moscow on July 15. “If, as we all hope, they are reunited with their families in the coming days and their health allows them to travel, FIFA would be delighted to invite them to attend the 2018 World Cup final as our guests,” he wrote in a letter to the head of the Football Association of Thailand. The Thai footballers, aged 11 to 16, have been stuck in darkness deep underground after setting off to explore the cave with their 25-year-old coach after training on June 23. Their harrowing ordeal coincides with the World Cup in Russia and it has not escaped the attention of players. “I’ve been speaking about it with a few of the boys,” said England defender John Stones, according to British media. Japan’s World Cup squad tweeted a video urging the team to “Hang in there!”, while Brazil legend Ronaldo called their plight “terrible”. “The world of football hopes that someone can find a way to take these kids out of there,” he said, according to CNN. Liverpool manager Jurgen Klopp urged them to “stay strong and know we are with you”, in a video message sent to CNN. Meanwhile the Croatian Football Federation said it was “awed” by the team’s calm under pressure. “We are awed by the bravery and strength that these young boys and their coach have shown amidst such frightening circumstances,” it said on its website. Many fans on social media said the boys deserved the World Cup trophy for the way they have handled their ordeal.